When I stopped using a cell phone it took awhile for phantom vibrations to go away. It really freaked me out at first. I’m guessing people that leave their phone sitting out on their desk don’t get this. Maybe they hear phantom desk buzzing? I HATE that! Especially on days when, for example, my mobile phone is in my right pocket, and I get phantom phone vibration in my left. My phones have all had the vibratory impact of a dead woodpecker (at least, when in my pockets). Generally, if my current one’s in my right front pocket, I feel the vibration in the loose fabric of my left front pocket. Set the thing on a desk, however and it will sound like a chainsaw chewing into a redwood tree and dance halfway across the room. Rather annoying. I had a similar problem wirh the steam chat alert back when I was addicted to trading in tf2. I hardly ever set my cell to vibrate. If I’m somewhere I have to silence the phone, I just set to “Silence”. When I do set the vibe on, it makes me jump nearly out of my seat. But at least I’m not so used to it, that Phantom Vibrate isn’t a concern. Hey, you get that too? I thought it was just me. I do hear phantom desk buzz. Also, I decided to call it something more interesting than phantom vibe – I tell people that I have been diagnosed with acute cellular vibrosis. Holy sniglet! That’s a diagnosis I can use for my friends and family. 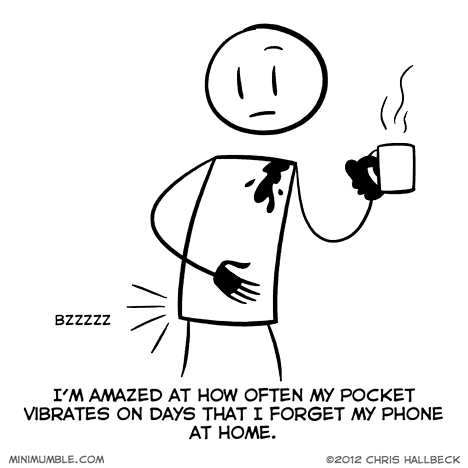 Phantom Vibration Syndrome. It’s a real thing. I hate it when I leave my phone at home, because I’ll reach for it and it won’t be there and I’ll start freaking out until I remember that I forgot it. The phantom vibrations thing is an actual condition, there’s been some research on the matter.